Citing historical injustices, environmental uncertainties and other factors, the U.S. Department of the Army is holding off on easements under the Missouri River for the Dakota Access Pipeline (DAPL) and halting construction pending further review. 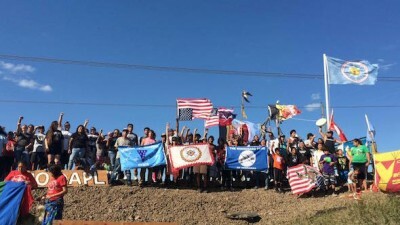 “The Army has determined that additional discussion and analysis are warranted in light of the history of the Great Sioux Nation’s dispossessions of lands, the importance of Lake Oahe to the Tribe, our government-to-government relationship, and the statute governing easements through government property,” the Army said in a joint statement with the U.S. Department of the Interior on Monday November 14. Energy Transfer Partners has been pushing ahead hard on construction and using heavily armed North Dakota state authorities as well as private security to keep hundreds of water protectors at bay and make its self-imposed January 1, 2017, deadline for operation. It has excavated and laid pipeline almost right up to the edge of Lake Oahe, the dammed-off portion of the Missouri River that was flooded more than half a century ago for the construction. The company has even constructed a drill pad in anticipation of receiving the easements to complete the $3.8 billion, 1,172-mile-long pipeline from the Bakken oil fields to central Iowa. Water protectors have been camped out near the construction site of the pipeline since April and have dogged the pipeline work at every step. More than 400 people have been arrested as they stood their ground against pepper spray, mace, rubber bullets and sound cannons, among other violent methods. Water protectors trying to stop construction that runs through sacred burial sites are met with mace, pepper spray and rubber bullets. “Together we can inspire people across America and the globe to honor each other and the Earth we hold sacred,” Archambault said.